The New York City book launch for Good Girls Marry Doctors, at The Asian American Writers’ Workshop (AAWW). From left to right: Swati Khurana, Piyali Bhattacharya, me, Jyothi Natarajan. 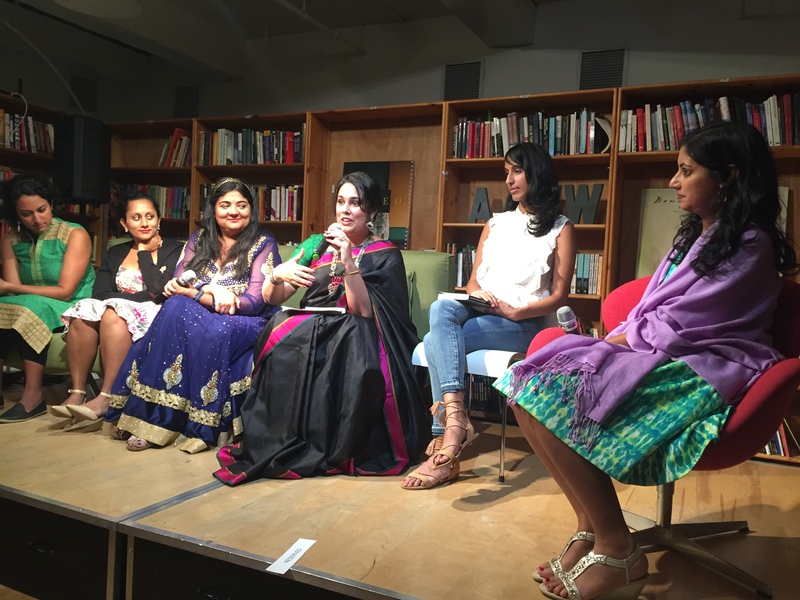 In 2016, Jyothi Natarajan of The Asian American Writers’ Workshop invited me to moderate the Q&A for the New York City book launch for Piyali Bhattacharya’s Good Girls Marry Doctors—an anthology of writing by contemporary South Asian American women. Piyali asked me to contribute an essay, but between planning a wedding (not to a doctor), helping to care for my grandmother, and teaching full-time, I wasn’t able to synthesize anything in time…at least not something about obedience and rebellion. Therefore, I was especially glad to be able to take part in the project and its launch in a small way. Readers that evening included Piyali and contributors Swati Khurana, Rajpreet Heir, Jyothi Natarajan, and Ankita Rao. The Asian American Writers’ Workshop just posted the podcast. Piyali opens the event with a beautiful history of how the anthology came to me. My introduction comes in at about 15:30 and the Q&A happens after the contributors read their essays. It’s worth listening to the whole program. I loved hearing these essays again. And it’s the first time I’ve been on a podcast! 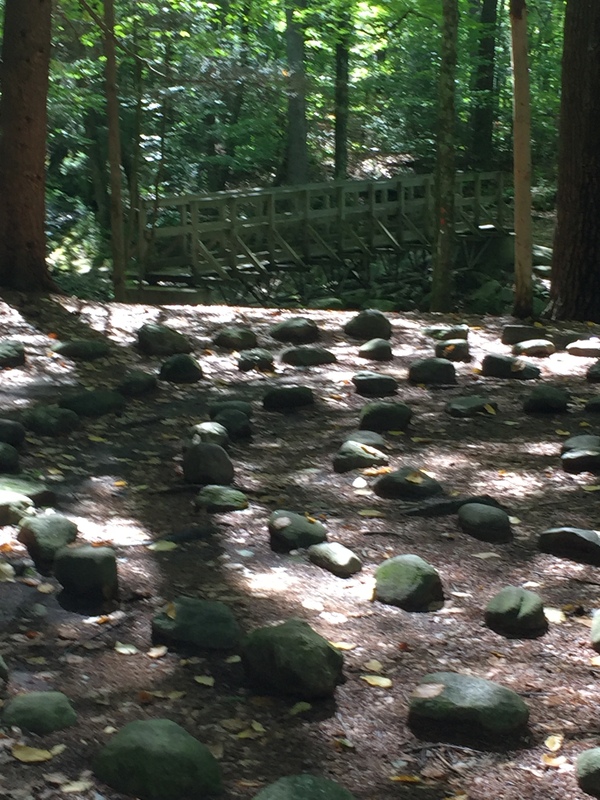 A labyrinth near Amethyst Brook and the Robert Frost Trail in Amherst, Massachusetts. My dear friend, poet Holly Wren Spaulding, suggested this walk in Amethyst Brook on the equinox, which is also her birthday. September is the month of the autumnal equinox—the time when summer ends and autumn begins. In the weeks before this, I was thinking about goals for the fall and mourning the end of summer a bit, especially for R, since his life (and mine) change dramatically once the school year begins. But not all change is bad. He loves teaching middle school and coaching tennis, and I love the fall. My fall classes at Writers & Books begin next week, in October, so I’ve had the chance to do some meaningful traveling and attend events related to art and writing in September. For that, I’m exceedingly grateful…especially since we’ve had health issues in our family, and our summer was mostly spent with parents, my grandmother, and extended family who had come to visit my grandmother. At the New York book launch for GOOD GIRLS MARRY DOCTORS: South Asian American Daughters on Obedience and Rebellion, held at the Asian American Writers Workshop. Some September highlights: R and I took a trip to New York—our first visit since we went there together at the end of 2013. It was a lovely vacation, instigated by an invitation from writer Jyothi Natarajan to moderate the Q&A for the book launch of the anthology, Good Girls Marry Doctors: South Asian American Daughters on Obedience and Rebellion (edited by Piyali Bhattacharya), at the Asian American Writers Workshop. Piyali had invited me to submit an essay to the anthology, but it was due right after my wedding, and I didn’t have the mind space to be able to see an essay through to completion then. So I was especially pleased to be able to participate in this book project in some way. It was a wonderful event—moving essays, a packed house, and a chance to reconnect to some of my literary community in New York. I’d vacillated on this next trip, but I am so grateful I went. 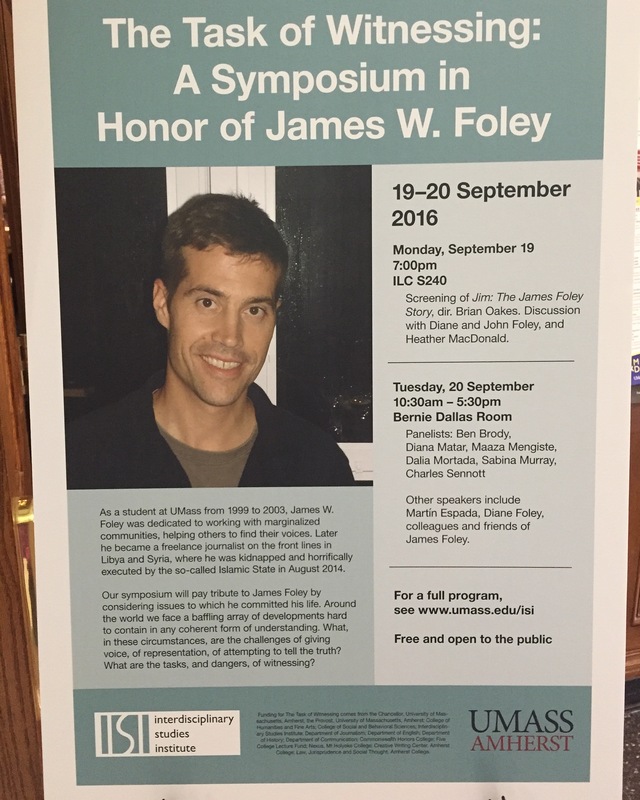 Stephen Clingman, a former professor of mine at UMass Amherst, invited me to take part in a symposium on the life and work and legacy of my MFA classmate, slain American journalist Jim Foley. Besides his work as a brave witness to the suffering in Syria, Jim was also a talented fiction writer. We were honored to spend time with Jim’s parents, John and Diane Foley, who also attended the symposium. Other writers on our panel included MFA classmates Erin White and Yago Cura; Jim’s friend from Teach For America, poet Daniel Johnson; our MFA professor, Noy Holland; and Jim’s close friend from Marquette University, Thomas Durkin. One of the writers for the documentary about Jim also attended—his childhood friend, Heather MacDonald. I read from an essay I’d started about Jim a couple of years ago and still need to finish. September brought with it the Rochester Fringe Festival, which meant the chance to see my favorite hometown modern dance company, Garth Fagan Dance. They have been inspiring me my whole life, and R and I were lucky enough to have one of the dancers, Natalie Rogers-Cropper, choreograph our first dance at our wedding. Fagan created his own dance vocabulary using elements of Afro-Caribbean, ballet, and American modern dance—and this influenced me as an artist; he extended what was possible, or what seemed possible. We all have different stories to tell, complete with different vocabularies. You don’t have to use someone else’s—in fact, you can’t. How liberating it is, but it requires confidence—a certain strength of will and belief in your story. 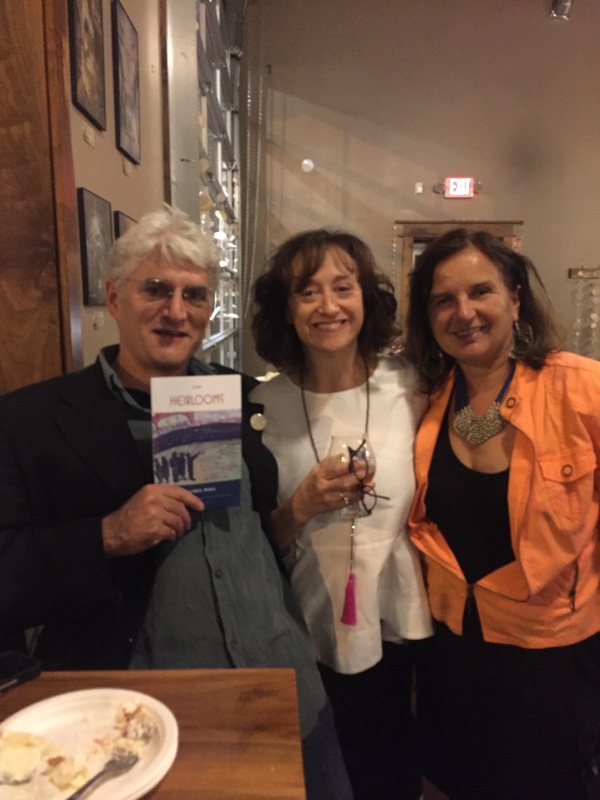 Rachel Hall (center) with Howard Solomon and Marijana Ababovic, 9.27.16. September also brought with it the publication of an essay of mine in Brevity: A Journal of Concise Literary Nonfiction’s special issue on Race, Racism, and Racialization—“Things People Said: An Essay in Seven Steps.” In addition, This week was the book party for my friend Rachel’s Hall’s debut collection of stories, Heirlooms. l was so pleased for her! In the last few years, we have talked a lot about the process of writing a collection and sending it out to find its home. I interviewed her about Heirlooms in my final column for the Kenyon Review Blog. Geoff Hancock: What do you think your strengths are as a writer? 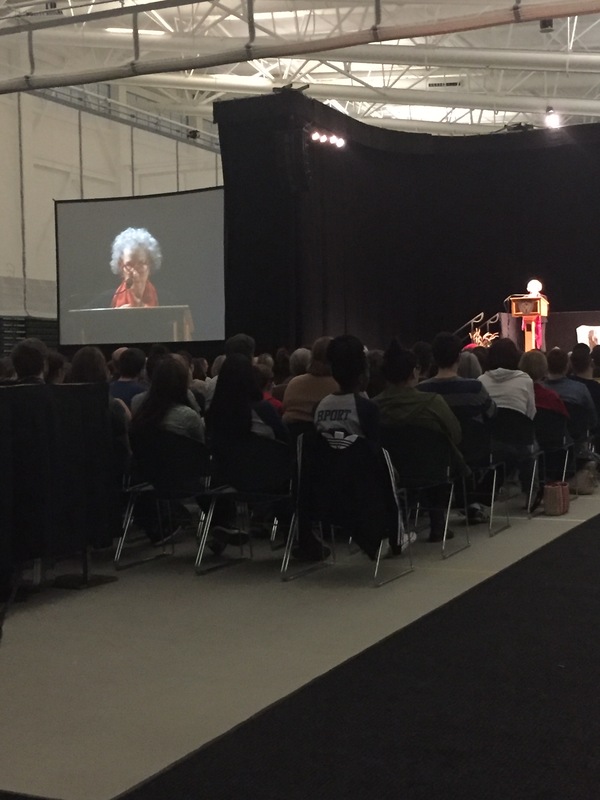 Atwood: I used to say, in the usual Canadian way, ‘Well, aw shucks,’ I don’t know.’ We’re trained to be modest. But now that I’m middle-aged I’m going to allow myself to say, ‘Well, maybe I’m good.’ Not all the time, but enough times, I can get the words to stretch and do something together that they don’t do alone. Expand the possibilities of the language. Atwood: Weaknesses? We can’t afford to think about those kinds of things. Most writers are tightrope-walking over Niagara Falls all the time. Look down and you’ve had it. If I thought too much about weakness I’d block. Let me just say I want to be her when I grow up. In the meantime, I’m learning to be me as best I can. It’s the task of a lifetime. Holly Wren Spaulding’s thoughtful essay on art installations in nature. My friend Meera Nair’s essay about food, longing for home, and the importance of cooking. A smart NYT article my friend, writer V.V. Ganeshananthan, recommended about networking. It’s about more than networking though—it applies to literary citizenship, manners, and being mindful about paying the help we receive forward. My friend, local writer Nate Pritts, on writing outside and the importance of spending time in nature. Last one: I heard Sarah Cedeno read this essay in July, but it stayed with me, and I’m adding it to this list to remind myself (and you) to take a look at her haunting essay about family, hoarding, and the stuff of life. What are your reading recommendations? I’d love to hear from you about them.